The Mermaid's Tale: Skin color and vitamin D -- a beautiful theory destroyed by inconvenient facts? Skin color and vitamin D -- a beautiful theory destroyed by inconvenient facts? I love a well-done challenge to an iconic evolutionary tale. Such tales are often easy to devise but hard to test, so I was intrigued to see that there was a new paper challenging what has come to be a well-accepted theory in Anthropology, the story of why skin color lightened as humans left Africa and migrated north. The new theory is all over the web (here and here, e.g.). And, there are certainly good reasons to challenge this iconic tale... but they aren't in this paper. We make most of the vitamin D3 (VD3) circulating in our blood when we're exposed to sunlight. The synthesize is a multi-step process, and we can store the VD3 we produce for months at a time. Light skinned people tend to have higher levels of circulating vitamin D3 than dark skinned people, because the dark pigment, melanin, blocks UV, and thus, VD3 synthesis. Severe vitamin D deficiency leads to rickets, with its deformities and accompanying weakness and so forth, and less severe but chronic low vitamin D3 levels in people with light skin are a risk factor for osteoporosis, bone fractures, and perhaps chronic diseases like type 2 diabetes, and so forth. Paradoxically, while on average darker skinned women have lower VD3 levels, they are also at lower risk of osteoporosis and fractures than their lighter skinned counterparts. The iconic story about skin color has been that when darkly pigmented humans left Africa 30,000 or so years ago. they were leaving regions in which dark skin was maintained by natural selection, presumably because it really does protect against sunburn and skin cancer. The descendants who eventually settled in northern Eurasian climes were then in places where lighter skin was beneficial because sunlight was weaker and the melanin in dark skin would have prevented the synthesis of enough vitamin D to maintain strong bones. So, during the many generations that it took humans to make their way from Africa to northern Europe, their skin lightened due to natural selection for a beneficial trait. This hypothesis has been challenged before, for numerous reasons -- notably in a paper by Ashley Robins in the American Journal of Physical Anthropology in 2009. Among other problems with the hypothesis are that there was no evidence of excessive rickets in the late Pleistocene and early Holocene, when humans were expanding northward, that light and dark skin both can synthesize vitamin D when exposed to sufficient ultraviolet B (UVB) radiation and that early humans in northern Europe would have spent much of the summer and spring outside, partially covered with animal skin, able to manufacture enough VD3 to last through the winter when the rays of the sun were weak. One might also note that the earliest depictions of human variation in art, not to mention evidence such as mummies, go pretty far back and show that Egyptians and others in their intensely sunny part of the world were not dark-skinned and they knew they were different from sub-Saharan Africans. So were they a back-flow from Europeans who had already become lighter? Or was lightening already a fact of human life before the expansion? Why are some African indigenes light skinned though living in the open desert? On the other hand, if sunlight exposure is not the reason that dark skin evolved, why are Americans darker in the tropics, especially those who live in jungle shade? Now a paper in a recent issue of Evolutionary Biology ("Evidence That Loss-of-Function Filaggrin Gene Mutations Evolved in Northern Europeans to Favor Intracutaneous Vitamin D3 Production", Thyssen et al. -- paywall) challenges the accepted wisdom for another reason. Thyssen et al. suggest that in northern latitudes, the skin wouldn't have been able to synthesize the required levels of vitamin D by loss of pigmentation alone, but a change in a protein that helps to maintain the skin as a barrier to outside elements could have facilitated increased VD3 synthesis. We hypothesized that loss-of-function mutations in the epidermal structural protein, filaggrin (FLG), could have evolved to sustain adequate VD3 status. Loss of FLG results in reduced generation of trans-urocanic acid, the principal endogenous ultraviolet-B (UV-B) filter in lightly-pigmented individuals. Accordingly, we identified a higher prevalence of FLG mutations in northern European populations when compared to more southern European, Asian and African populations that correlates significantly with differ- ences in circulating 25-OH-VD3 levels in these same populations. That is, it was changes in the filaggrin protein that enabled people in northern climates to make enough vitamin D, rather than decreased melanin. And, indeed, Thyssen et al. write, the difference in skin color from the tropics northward is not nearly as finely graded as filaggrin variants; this, they believe, is a convincing reason that the latter is more likely to explain why northern peoples produce enough VD3. 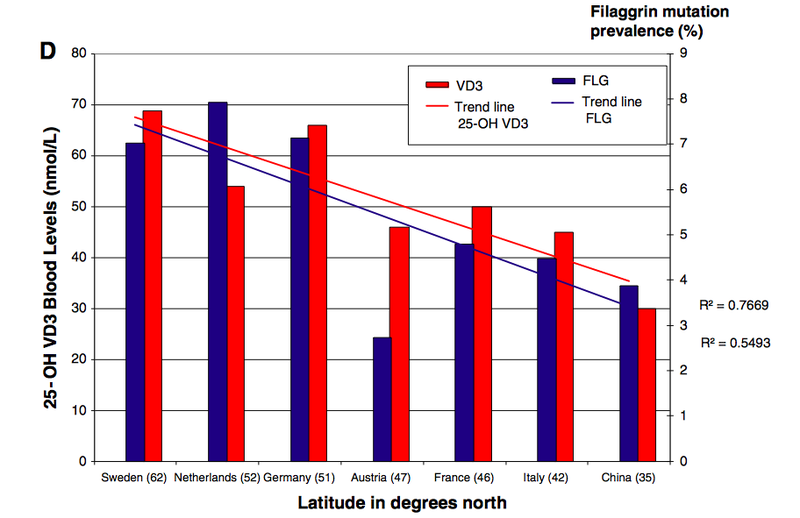 Vitamin D by frequency of FLG variation; source Thyssen et al. The authors also write that because people with dark skin can produce vitamin D as efficiently as people with lighter skin, this would have meant no adaptive pressure on skin color as people moved northward. While skin did lighten in the far north, it didn't lighten everywhere -- Inuit and northern Asians, for whom seafood, the best food source of vitamin D, has long been a large part of the diet, still have substantially pigmented skin. Some Africans don't, though living in open, sun-blazed unforgiving desert. And, even the lightest skinned inhabitants of the far north can't synthesize enough VD3 to maintain healthy bones, so something other than pigmentation must have changed. And indeed the VD3 pathways did change, at least in some people; polymorphisms in genes involved in VD3 synthesis and transport have been identified in Europeans (Wang et al., 2010), and are associated with increased vitamin D3 levels. Thyssen et al. also report European variants in the FLG gene, which is involved in skin architecture. The variants seem to enhance UVB sensitivity, but they also seem to increase susceptibility to various conditions such as dry skin, ichthyosis vulgaris, and allergies. This is sounding like a good story. There are problems. The correlation between these variants and VD3 synthesis are, as Thyssen et al. themselves say, currently only correlations, not demonstrated causal relationships. The authors suggest that looking for FLG variants in Inuit populations could make or break their hypothesis; if they had lower frequencies of these variants, it would be supportive because they have always eaten vitamin D-rich seafoods, and have darker skin than most peoples in the far north. Nice idea. Unfortunately for this whole hypothesis, however, the frequencies of the FLG variants that Thyssen et al. are reporting are, well, very low; 7.02% in Sweden, 7.86 in Denmark, 11.0 in Canada. Yes, there is a gradient (0.91% in Tunisia), but these kinds of frequencies really can't explain why whole populations in northern latitudes don't have rickets. So at present these are strong claims and shouldn't be treated as if they show a major new theory, based on the rather thin evidence available to date. It's often difficult to reconstruct evolutionary scenarios, which is why strongly held stories such as the vitamin D/skin color story should not be so strongly held. While there are, we think, compelling reasons to question the conventional wisdom about vitamin D and skin color, this new report isn't yet a convincing replacement. However, it does raise the question of whether there are other vitamin D synthesis or absorption pathways that aren't yet known, and that might explain, for example, why lower serum vitamin D levels aren't as deleterious in dark-skinned women as in light-skinned women. Melanin is in some immune pathways, so there could be other correlates of 'climate' that don't involve vitamin D. Indeed, this story may not yet be completely told. Thanks for sharing the complexity Anne! I'm confused about something... how would a low level of FLG in high latitude populations that eat D-rich foods be a make or break test of that hypothesis, especially relative to the melanin one? Sorry not to be clear. The idea is that to live as far north as the Inuit do, if the skin color idea is correct, they'd have to have lighter skin than they do. If the FLG idea is correct and it's not skin color that allows them to make vitamin D, but FLG variants, they'd have to have one or more of the FLG variants that boost vitamin D synthesis. If they don't, Thyssen et al. will consider this a blow to their theory. Also, are some FLG variants causing wrinkles? And if so, could we take away from this article that our craggy, saggy faces might be a by-product of adaptation?! A confounder, though, may well be that they have had enough seafood in their diet that synthesizing their own hasn't been as crucial as for inland populations. I don't happen to know whether it's possible to consume enough fish etc. to meet vitamin D needs. The vitD dogma has been around almost as long as the skin cancer one has. We were being told about archeological rickets cases as support when I was a graduate student. Scientific hypotheses arise for what are usually good reasons (Sasquatch aside--well, there are those Gigantopithecines....), but they they build and become so entrenched as to be largely immune to actual evidence. There are many examples of things making their way into textbooks, copied from one textbook to another without passing Go (actual examining of the data) and being treated as Truth. Historians of science have shown this clearly, but it doesn't seem to make much difference. Right, Holly (simultaneous messages crossing here). Right so why would the authors think selection for FLG would be any different in their case? Maybe they think that if FLG variants are like lesser melanized people's then they'd be onto something both about FLG's role (and possible selective pressure due to it) and ALSO onto something about dietary Vitamin D? One of the authors of this paper is a dermatologist and, I deduce, came to this topic from that angle. FLG variants seem to be involved in a number of skin conditions. Will we now have anti-wrinkle FLG-based gene therapy? Wouldn't bet against it! Hold on... going to check the paper so I don't put words into their mouths. I agree that when there is an adaptive hypothesis to explain something, we could and should, especially in textbooks where education is key, habitually contextualize them in a greater complexity to the story, even if it is not yet known. Could you email it to me please? Here's the paragraph from the paper. Doesn't answer your question, as I read it. "To test our hypothesis further, it would be useful to determine both the prevalence and FLG mutation profiles in northerly-residing Inuits, who have always consumed a marine seafood diet. 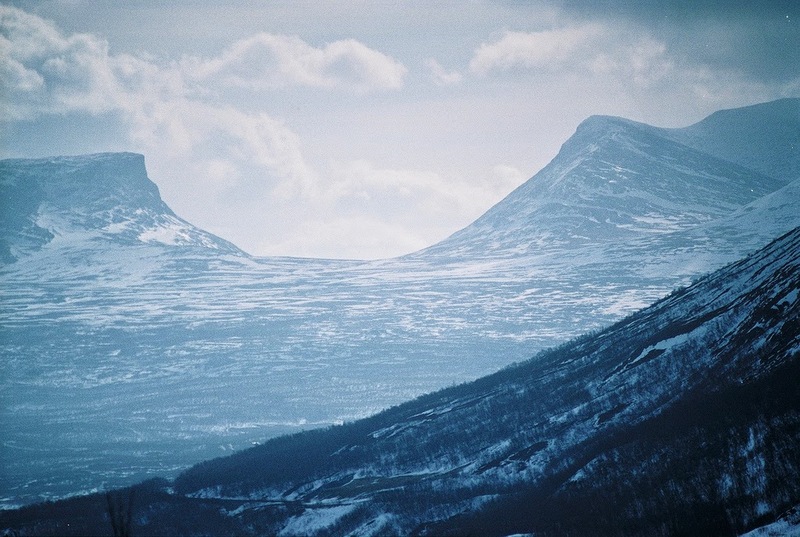 If the prevalence of FLG mutations is lower in Inuits than in lightly-pigmented northern Europeans, this observation would lend strong support to the hypothesis that FLG mutations likely evolved to increase VD3 synthesis. In contrast, if the prevalence of FLG mutations proves comparable in Inuits and northern Europeans, then the FLG–VD3 hypothesis becomes more tenuous. Finally, it would be relatively straight-forward to assess whether FLG deficient-humans generate higher circulating 25(OH)D3 levels in response to incident UV-B irradiation than do wild-type individuals with comparable degrees of pigmentation." The problem is the deep one that people love a good story that's plausible enough to state, whether or not it is really 'proven', or to acknowledge that proof is very hard to come by. There are all sorts of reasons why this is so (people want their myths generally). To be fair, if you write a text you can't actually know all the evidence and must rely on the literature. So the latter is where some raise in circumspection is most called for. As I see it, it only "becomes more tenuous" if dietary VitD compensates for whatever's lacking (and shaping adaptations) in northern Europeans with relatively less/little dietary VitD. What if 'skin color' is not a singular meaningful trait, but a complex part of some one or more systems, and hence affected by more than one, non-synchronous evolutionary history? As noted in the post, melanin is involved in some immune system pathways (in ways I forget), so the global pattern could reflect differences in exposures, for example, and that could differentiate tropics from cold climates. This would make much of the other discussion more or less irrelevant, even if skin cancer and rickets and so on were also affected by pigmentation. I think they acknowledge the possibility of dietary vitaD compensating with one hand and take it away with the other. It's definitely a potential confounder! But, the bigger problem is that such a small percentage of northern European populations have these FLG variants anyway, so the hypothesis, it seems to me, is already quite tenuous. And then there's the related problem of presentism. I've tried to explain to some friends that to expect every population's skin to match its UV environment runs against good evolutionary thinking, even if the melanin hypothesis is the correct and strongest explanation for human skin color variation. But I'm not sure I was able to get my view across. A good additional point! When someone says, hey! the Khoisan people are roughly as light as some Europeans and they get cooked by the sun every day. So the defensive posture for a hypothesis is that they didn't always live out there. In other words, a theory can always be defended by post hoc arguments. The problem, as you say about presentism, is that one can always do that but sometimes might be right--but usually we can't tell. When there's nice correlation between geography and a trait... why isn't the default assumption that drift and gene flow explain the cline? Adaptations require lucky mutations to pop up, and to get nearly just-as luckily propagated, and ALSO to affect survival and reproduction. That's a lot to expect and a lot to demonstrate with evidence too. Well,the defense of that would be that we only invoke selection for such data after the fact when selection actually happened. When there wasn't any adaptation to explain, we don't. A general truth is that there is always enough variation to respond at least to gentle selective pressure (experiments show that), and drift and population dynamics leave particular signatures (for example, genetic distance patterns) that are found genomewide. The adaptive story would be expected to be stronger than the average demographic background. But unless strong and recent, selection's signature is very hard to detect against that background. Scholar google finds only 56 hits when I search for human genetic drift in the title. Well various alternative terms would turn up many thousands, and in a sense almost every human population relationships analysis is based on drift assumptions. But people typically assume, incorrectly, that this applies only to functionless sites in the genome, and that all the 'action' is driven by selection. Many or even most of my Crotchets columns have tried to address this (but the message doesn't sink in very well). I'm jumping into this late in the conversation (and admittedly haven't read all of the comments), but Ken's comment --"What if 'skin color' is not a singular meaningful trait, but a complex part of some one or more systems, and hence affected by more than one, non-synchronous evolutionary history?" --seems logical to me. It's been a while since I did skin pigmentation research and I haven't kept up with the literature. But we know that there are skin pigments beyond eumelanin and pheomelanin (carotene and hemoglobin among them). And scientists have thought folate photolysis has played an important role in pigmentation change as well as vitamin D biosynthesis. Even the simple story of an inverse relationship between burning vs tanning responses isn't carefully considered (and may, in fact, be wrong). Given the differences of immediate and delayed tanning, I find it hard to believe that there isn't a great deal of information about immunological responses that have played roles in pigmentation evolution that we just don't understand yet (and I suspect it's likely that at least some pigmentation change was as by-products of other responses rather than any kind of direct adaptations to UVR). Thanks. This illustrates some of the issues, and actually similar complexities regularly arise when simple evolutionary adaptive tales are told. Personally, I think biologists and anthropologists haven't got nearly enough respect for the challenges we face if we want to explain things that arose slowly, over long historical time periods, &c.
The amount of exposure to ultraviolet light from the sun during the Pleistocene would have also depended on how much clothing they wore and also how frequently they went out doors. Muslim women who wear traditional Islamic clothing tend to have higher frequencies of rickets. Obviously, humans, especially Neandertals, living during the cold glacial periods of Europe would tend to stay indoors more and to cover much more of their body up with clothing while humans living in the tropics probably went around almost completely naked most of the time. Humans probably covered their infants up as much as possible to avoid exposure to the cold. Another nutritional/metabolic effect of melanin is to prevent photodestruction of folic acid. Those are just a few of the issues that make this a difficult hypothesis to test. I think one of the weakest statements in this paper is the proposition that "the universal imperative for metabolic conservation" led to the demelanization of northern populations, because "they just didn't need to waste the energy making it anymore." That's the same low watt idea espoused by one of Holly's students, who attributed loss of body hair to the fact that since we wear clothes, we don't need hair any more. This discussion isn't wanting for complexity, but consider also these facts. Filaggrin's role in supplying the stratum corneum with trans-urocanic acid is that of a barge full of histidine. "Loss of function" means it actually must be so mutated as to not show up at all - like vitellogenins, which are barges for hauling amino acids into eggs. Changes in non-conserved residues probably don't mean anything. Unfortunately, even the Irish elk story has been questioned. I don't know enough to have a view about that, except that to have gotten there in the first place, installed enough in the population for it to be found in the fossil record, it had to be 'fit' enough to replace its competitors. So we don't really know why it then became 'unfit' and it's just too easy, I think, to create stories that are hard to refute or to 'prove'. Your points in the first paragraph relate to widespread views about relaxed selection. They idea is that if a trait is not necessary enough, mutations will eventually damage or erase it. So, the view would go, if hair is covered by clothing and is no longer needed (for insulation) then mutations will make it eventually become very unorderly and then to go away. The energetic argument is that selection removes costly things because of tight darwinian competition. Of course how long this would take would depend on all sorts of things such as whether the same gene pathways are used in other indispensable traits, etc. The C-paradox, of the amount of total DNA relative to species phylogenies and relative to the amount that is 'functional' relates to the same idea, which is the belief that things that are costly must be detectable by selection. I think that's a mistaken idea and that complexity. All these points are involved in how people evaluate non-conserved aa's, which are often laden with blanket but untested or untestable assumptions. But I don't know enough about the specifics of filaggrin or skin biology to comment on that. Why I had written about that example of a student's hypothesis for body fur loss was *not* because that scenario isn't legitimate, and not because relaxed selection isn't a factor in how evolution unfolds but because of that very common non-understanding/awareness of it combined with unscientific and sloppy language. So many evolution students (a) assume that scenario *is* actually natural selection and write it when asked to provide a natural selection scenario for our body fur loss, and (b) don't know, and have a really hard time learning, that this scenario they provided is really about relaxed selection, mutation, and drift. There's another issue to consider in this story: modern humans may have lived happily in northern latitudes for tens of thousands of years with dark skins. Two mesolithic ancient DNA samples, one from Sweden and one from Sapain, both about 8000 years old, carry the ancestral alleles at pigmentation genes, and may have had dark skins (Olalde et al. Nature. 2014 Mar 13;507(7491):225-8; Skoglund et al. Science. 2014 May 16;344(6185):747-50). The Spanish individual lived 100 miles and a 6,500-ft mountain range away from the see, so he may have consumed very little seafood. I hear that a third example is about to be published. Intriguingly, ancient DNA samples from the Neolithic, just 2,000 years older, all carry the derived alleles in those loci, for which the genomic imprints of natural selection seem quite clear (Sturm, R. A. & Duffy, D. L. Human pigmentation genes under environmental selection. Genome Biol. 13, 248 (2012)). It may well be then that the selective pressure on these pigmentation genes was not exerted by latitude. Thank you for these references! I am unclear how this relates, as I think it perhaps should, to the apparently lighter skin of Egyptians and northern Europeans at the first evidence (art and mummies, at least). This would not be the first TrueStory that wasn't so true, when it comes to evolutionary adaptive explanation. Personally, I think there is much that may be quite fundamental that we don't yet understand about selection. Thanks, Francesc. The plot definitely thickens. The timeline for the lightening of the European skin is now much better established: http://biorxiv.org/content/early/2015/03/13/016477. The story must be complex because I think there is evidence of skin pigmentation variation more or less as we see it today, in north African rock art and in the Egyptian mummies and art, and the latter was around 6000 years ago. I don't know what the Egyptian's pigmentation genes show, but someone must. However, Egypt is a very sunny place, so why if the vit D or selection stories are correct, would they not have high levels of pigmentation? Maybe this is known but not to me, but it does complicate the idea that Europeans were still dark-skinned for a long time. A recent study by Eaaswarkhanth and colleagues in Genome Biology & Evolution (http://gbe.oxfordjournals.org/content/early/2016/09/26/gbe.evw242.abstract), didn't observe the claims of Thyssen et al that FLG loss-of-function is adaptive in northern latitudes with lower ultraviolet light exposure. In this new study, they have also shown that the frequency of FLG loss-of-function variants does not correlate with latitude attributing to the fact that the previous study suffered from ascertainment bias.